This model update fixes the VC and Virtual Cabin missing and transparent areas. Note: These models only try to fix the original problems listed above. They are not all new DX10 Preview compatible models. Does this patch include the fix for the VC when any lights are switched on? Will post if I have any problems. Any point in downloading and installing these models if you're still running FSX SP1 - i.e. are there any other fixes included apart from the texture problems with FSX SP2? They should work with all versions of FSX. Probably more for SP2 though, but it may affect SP1 and the original versions in various areas also, but not in bad ways. Konrad, I know this update affects some borders of things like the overhead and other areas. Loaded up the ATR in FSX SP2 + Accl. and regret to report that it has made things in the VC worse for me! The textures surrounding the overhead panel, radio stack etc are indeed all fine now when lights are switched on, however, the following two screenshots show the excessive blurries which have been introduced in several places. As it stands the ATR is unflyable for me from the VC, more so than before the patch I think! Keen to hear if anyone else is seeing the same? FYI: I'm on a 22" at 1680x1050 and am not using the widescreen switch in fsx config file. I will have to let Hans look at this, as I do not know how to configure textures or panels. Maybe there are double entries or something that has to be cleaned up in the panel.cfg file. Konrad, are you sure that you havn�t had the display problems before installing the patch? Generally speaking certain areas of the VC were never really all that clear to begin with but certainly useable. The Autopilot panel in particular was always "a little on the blurry side" ever since I installed the ATR from CD but this new patch seems to have made it a bit worse. My EFIS panel was perfectly fine until I installed this new patch. That's for sure. I suspect that this is a pretty isolated case, given you are the first to comment in almost 3 days. So this now means a detailed analysis of installed add-on's, machine specs, re-install ATR etc etc which I do not have the time for. Setting the panel quality to "high" doesn�t chance anything for me. 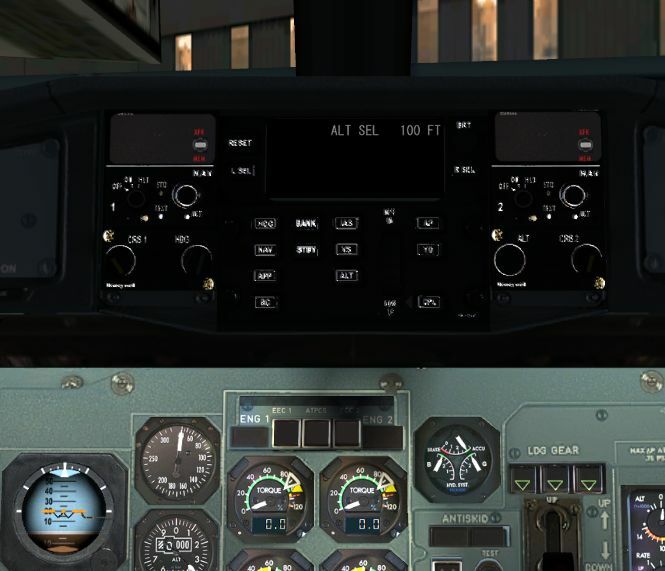 I�ve made several clean installations of FSX and ATR but could not get rid of it. I also tried different graphics drivers (169.02, 169.15, 169.44, 174, 175.12) without success. :( FSX SP1 and SP2 dont make a difference. I think we need to see your FSX graphic settings and graphic card settings to get this solved. Ok, i will start a new thread with all requested information later. Contrary to Konrads post, the FSX model update did not worsen anything in my ATR. The transparent textures are now all covered with a (grainy) grey texture. The luggae space is now displayed correctly. Overall the patch is a big improvement. 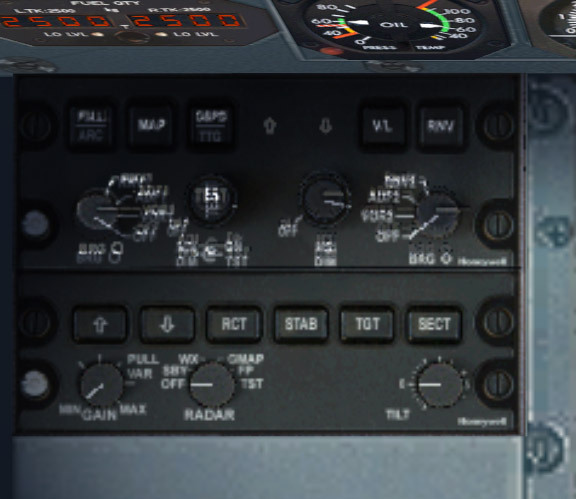 Firstly, could someone who is running FSX SP2+ with a non-widescreen resolution (1024x768 for example) confirm or otherwise if they also experience these blurry panels in the ATR VC? Is there a difference between lights on and lights off perhaps? I fly the pmdg 744X a lot and here too some of the text textures (as opposed to font displays) are not great at all. Nowhere near as bad as with the ATR though! 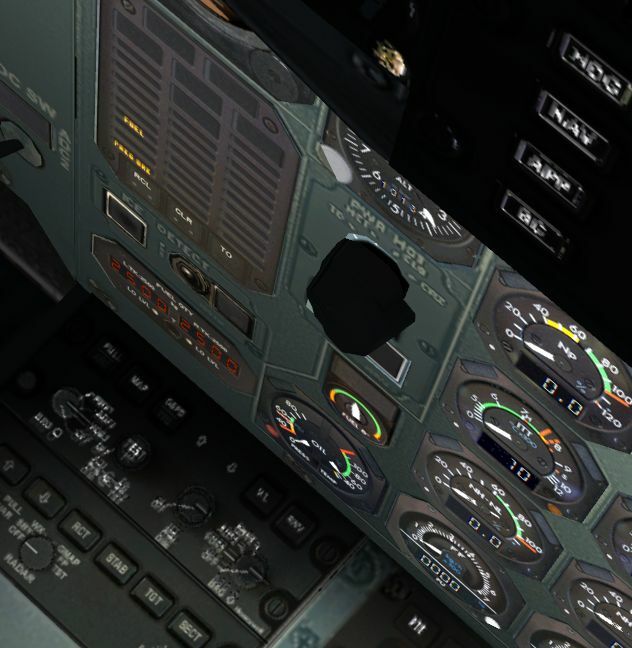 As far as I know neither the ATR nor the 744X VC textures are 'rendered' for widescreen so if you are using widescreen (like I am) then these textures have to stretch accordingly with detrimental effects. Could someone more in the know comment on this? There are one or two newer GA add-on's out there which do have VC textures specifically developed for widescreen as an option but I do not own one so again cannot compare what the differences are. Finally, I own 3 boxed Flight1 aircraft (ATR, 441 Conquest and the 172 Skyhawk) and these are all FS2004 aircraft which have been made compatible with FSX as opposed to having been developed specifically for FSX. As a result they all have issues (some more than others) and my guess is that they will continue to do so until they are fully updated. On all 3 boxes it prominently states that these are aircraft for Flight Simulator X in big text, with a small note below this stating "and for flight simulator 2004". In reality this should be the other way around but I will be the first to admit that I would probably not have bought these aircraft had this been the case. Score 1 for the Flight1 Marketing dept. This may not be the right place for these comments but it is important to keep this all in mind when trying to troubleshoot something that may well be beyond fixing until these aircraft are made FULLY compatible with FSX SP2/Acceleration. DX10 compatibility is something else entirely seeing as FSX itself is not there yet (and will it ever be?). Its definately nothing about our widescreen resolution. I�ve just plugged in my old 19" TFT and took two screenshots in 1280x1024. The panels are only blurry at night - at daytime with strobes/nav lights etc. on the panels are fine. Another bad visual you may notice is that the PWR MGT-selector is almost pure black. Same applies to the gear lever, parking brakes, throttles and condition levers. Stephan, is the autopilot panel also only blurry at night for you (with lights on or off) or is it blurry with daytime textures as well? Levers and knobs (and autopilot panel?) do not have any night/lighted textures at all it looks like. Steven, Hans - any update on these issues? Ok, I finally got home to test this. I have crystal clear textures in daytime (no lights), but blurry textures at night with lights on. Same as above and also updated with latest patch. High Quality textures in FSX and no Bloom. coming back to the model update: it seems that the propeller issue has not been fixed, the propellers are still too strong before a dark background and invisible before clouds. Will there be a separate fix for this? What I also noticed was that after installation, my cockpit textures were mixed. I had the brown cockpit as default, after installation some parts of the cockpit were blue. Running the config tool again fixed it, but I suggest the installer should give a hint to this issue. Another question (has nothing to do with the update): when enabling the transparency option for the VC, it seems that the reflections only show the brown interior, even with the blue cockpit enabled. Will there be a fix for this too? Regarding the propeller, this is a FSX bug, so this cannot be fixed. It is because of FS9 based GMAX models. I did not see a lack of reflections in the blue VC. This may have something to do with your settings. Did you select high resolutions also? I just tested the VC and there were interior reflections on the glass. I just discovered that these graphics were always like that in the VC. I checked the FS9 install and it showed the same thing. I think it has to do with the light map file. This is from my early investigations. Are you sure the earlier version did not exhibit this? regarding the VC: what I meant was that the reflections do show in the blue cockpit, that's ok. But the reflections show the brown coloured interior, for example the orange seats, not the blue interior. This problem existed before the model update, even with FSX SP1. regarding the propeller issue, I remember that Hans mentioned it could be fixed by another texture. At least, this seemed to work for other models (like the MAAM DC3) . Is that not possible for the ATR? 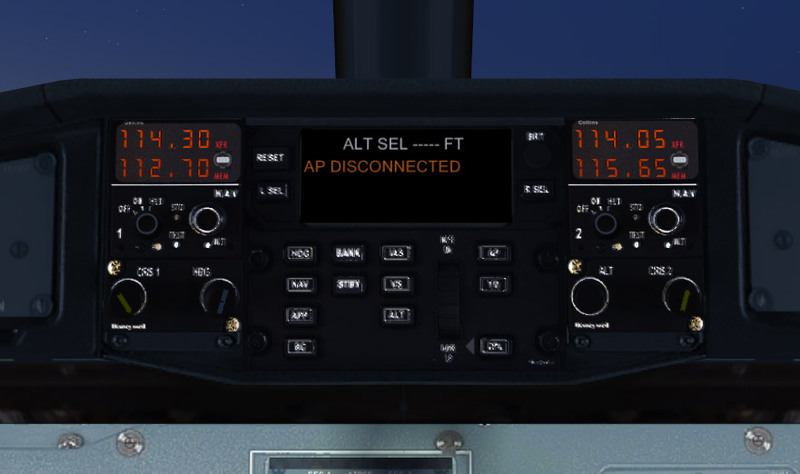 The Autopilot panel has always been on the blurry side ever since I installed the ATR from CD, back in FSX with no SP days. I did not own FS9 so cannot comment. Obviously I re-installed everything correctly post SP1 and again after adding Acceleration. My EFIS panel was most certainly NOT as blurry as it is now post the patch (this is at night with lights on). I would have posted about it for sure had it been this bad. I have not yet checked during the day (with lights off or on) but it seems that other folks are only experiencing the blurry EFIS panel at night (irrespective of lights)? Q9450, 790i ultra, DDR3 1333, Single 9800GTX with 177.39's (8AF, 4AA) at 1680x1050, XP SP3, FSX incl. Accl.